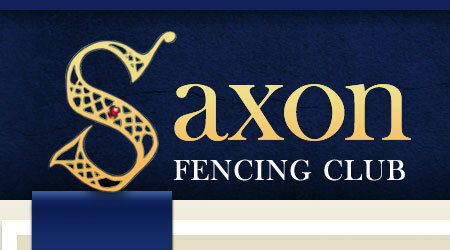 Four Saxons took part in the inaugural City of Chichester Open at the weekend. After a slow start, Wayil (seen here resplendent in denim-look lame) came through the two rounds of poules pretty well, winning six from eleven, to seed him 24th. In the incomplete last 64 he nearly threw away his good work with an over aggressive display, finding himself 11-8 down at one point. However after some sage calming advice from skipper Paul at the interval, he changed tactics, took a more defensive approach and turned the bout around to earn a last 32 place. Here he faced the Italian Allessandro Macchiarola, a deft flicker and conceded the first five points without reply. Wayil then once more cannily changed tactics, attacking with repeated fleches. He had marginally the better of the remainder of the bout, but that initially deficit was too much to make up and Wayil went down to an honourable 15-11 defeat. This gave him 24th place overall, his first to half finish in an Open. Details are sketchier on Edz’ performance (the Ghost being in Derbyshire having pre wedding photos taken) but his poule results just placed him in the bottom half. He won his first DE but was also eliminated in the last 32 to take 31st place, enough to earn him ranking points. Paul had typically strong poule results, winning all but two of his bouts. This gave him a bye through the first round and a reasonably easy victory in the last 32. In the last 16, however, he also faced Macchiarola. The wily Paul was a better match for the Italian than the athletic but less experienced Wayil. In a cagey bout they exchanged point for point until the end of the nine minutes of fencing time approached. Lowen then found himself a point behind with only fifteen seconds on the clock, forcing him into uncharacteristically reckless attacks which the Macchiarola dealt with to open his lead further when the clock ran down. Just denied a quarter final place, Paul was 11th overall. In the Women’s’ Foil Cat, bravely taking on such a high standard tournament so early in her fencing career, finished 22nd. The experience against some high quality fencers can only serve to help her achieve her potential.